A hostile takeover has just happened to the Copperhead OS Project. Lead developer Daniel Micay has been fired by Copperhead CEO James Donaldson. Micay claims Donaldson is up to no good, and Donaldson says it’s Micay who doesn’t have the company’s best interest in mind. Who’s to blame? Was the government part of this? What has been publicly released? 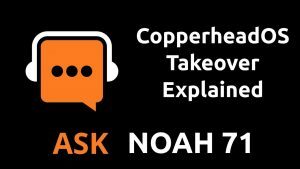 Will the CopperheadOS project survive? We break that down for you plus your calls in this week’s episode.